Written by Megan Fitzgerald and Alina Afinogenova, students in the Health Law and Policy Clinic, Fall 2017. 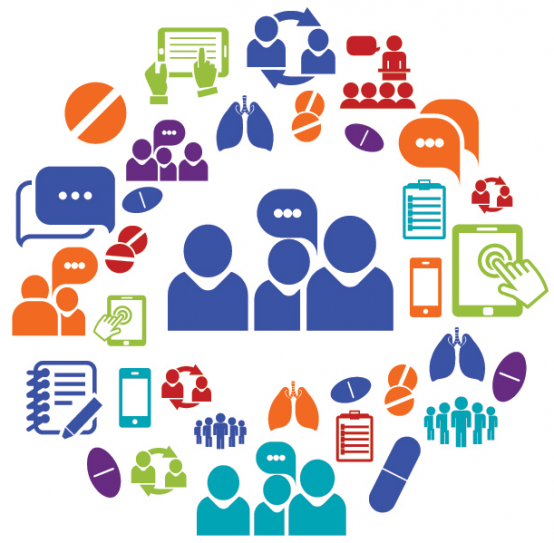 On November 9, 2017, we had the opportunity to attend Revolutionizing Complex Cancer Care in the Community, a policy summit in Washington, D.C. on the Association of Community Cancer Centers’ Optimal Care Coordination Model (OCCM) for lung cancer care. This event, co-hosted by ACCC and CHLPI, was designed to educate attendees on the OCCM and obtain their feedback on how the model aligns with current state and federal policy priorities. The summit brought together a broad spectrum stakeholders in the lung cancer space, including representatives from five cancer programs that are currently testing the model, federal policymakers, and other interested health care organizations. A major theme of the summit was the idea of continuity. Dr. Raymond Osarogiagbon opened his keynote address by stating, “Discovery, without implementation, is dead.” This powerful message was echoed throughout the summit—the idea that every challenge presents an opportunity for discovery and innovation, and every discovery presents a new set of challenges. We found this message to be particularly powerful as it embodied both a celebration of the progress made as well as an acknowledgment of the challenges yet to come. In the lung cancer space, access to care and care coordination remain major challenges, particularly for the Medicaid population. Many of the presenters, therefore, highlighted how they have used the OCCM to innovate and improve their capacity to deliver coordinated, patient-centered care that addresses the unique barriers experienced by Medicaid populations. OCCM testing site representatives also emphasized the OCCM’s role in addressing challenges related to accountability. Speakers explained that having the OCCM as an assessment tool not only allowed the sites to honestly assess their own activities and identify the areas in which they could improve, but also gave internal champions a platform from which they could encourage others to improve and meet their targets. Additionally, the event captured the very real and emotional challenges that lung cancer patients face in seeking care. Despite the OCCM’s focus on gathering and utilizing data, the importance of the human element remained apparent throughout the event. Hearing about the experiences of one patient still waiting for care and another who won the battle against lung cancer was powerful, and really brought home the importance of the coordination efforts that are being implemented by these organizations. Finally, it was incredible to see the level of enthusiasm in the room throughout the event. Attendees were enthusiastic about the model and eager to contribute their thoughts, concerns, and successes regarding its implementation. Participants were also happy to share connections and resources, which was encouraging to see given the current turbulence in the health care space. Overall, it was an incredible opportunity to attend the summit and be a part of a conversation that will hopefully help to shape the delivery of lung cancer care in the United States in the years to come. Originally published by Georgia Voice on November 28, 2017. Written by Ryan Lee. Already set to charge higher health insurance premiums next year, most of the companies that provide plans via the Affordable Care Act (ACA) marketplace in Georgia are also trying to sidestep one of the tenets of the ACA in the coverage they offer to people living with HIV/AIDS, according to new data from the AIDS Research Consortium of Atlanta (ARCA). ARCA analyzed all of the health insurance silver-tier plans available through the ACA, which are the most commonly used plans and are intended to be the middle ground between low-premium, low-coverage bronze plans and more costly and comprehensive gold and platinum options. Researchers found that the four insurance providers in Georgia—Blue Cross Blue Shield of Georgia, Alliant, Ambetter and Kaiser—placed most, if not all, of their HIV/AIDS medications on a tier that requires the most out-of-pocket contribution from consumers. “A lot of insurers say that they’re not discriminating because they’re not changing their premium based on a pre-existing condition, which is what they would have done before the Affordable Care Act,” said Callan Wells, who led the analysis of ACA silver plans for ARCA. There is no standard for structuring coverage of medications, with each insurance company developing its own tiers for drugs and how much coverage is included in each of those tiers. Most commonly, drug companies place generic drugs with a low co-pay on the bottom tier, and preferred drugs that have a flat co-pay on the second tier; non-preferred medications with higher out-of-pocket costs are on the third tier, while specialty drugs that have a high, variable co-insurance obligation are placed on the highest tier. Blue Cross Blue Shield, Alliant and Kaiser placed all of their HIV medications on the highest tier, requiring between a 40-50 percent co-insurance payment by the consumer each month. “What they do when they put all of the drugs on the very highest tier is, in essence, discriminate against people with HIV by putting all of the their drugs out of reach,” said Dr. Melanie Thompson, principal investigator at ARCA. In September, Georgia insurance officials approved a proposal from all four insurance providers to increase the cost of premiums by more than 50 percent, meaning some 2018 plans require consumers to pay up to $400 per month just to maintain coverage. ARCA conducted the review of ACA plans in Georgia to help folks navigate the federal marketplace, and has provided its raw data to ACA navigators at the Health Initiative and at Ryan White clinics. But the analysis was also a collaboration with the Harvard Law School’s Center for Health Law and Policy Innovation, which is using data from 16 states to try to improve access to medications. The placement of HIV medications in the highest pricing tiers could subject insurance providers to multiple civil rights complaints with the office of civil rights at the U.S. Department of Health & Human Services, which oversees the ACA’s non-discrimination provision, Thompson said. In 2016, ARCA and the Harvard center filed a complaint regarding HIV medication being restricted to the highest tiers against Humana and Cigna, both of which no longer participate in the Georgia ACA marketplace. That complaint included comparing whether drugs for other chronic conditions such as rheumatoid arthritis were placed exclusively in the most expensive tiers. Blue Cross Blue Shield, which pulled out of the metro Atlanta marketplace and is the only ACA provider in south Georgia and other rural parts of the state, not only placed all of its HIV medications on the highest tier, but also does not include common HIV treatments in any of its coverage. Kaiser, one of the two providers covering Atlanta, also put all of HIV drugs in tier four and five, with most having a 50 percent co-insurance payment. Ambetter, the other provider offering plans in metro Atlanta, stood out in ARCA’s analysis for the affordability of its drug prices, although Thompson said it’s important to remember that the value of an insurance policy is not solely determined by drug coverage. Written by Eva Perroni for Food Tank, November 2017. The second edition of Good Laws, Good Food: Putting Local Food Policy to Work for Our Communities, a toolkit for advocates working at the local level, was released by the Harvard Law School Food Law and Policy Clinic and the Johns Hopkins Center for a Livable Future. “Local food advocates are playing an increasingly important role in transforming local and national food policies. 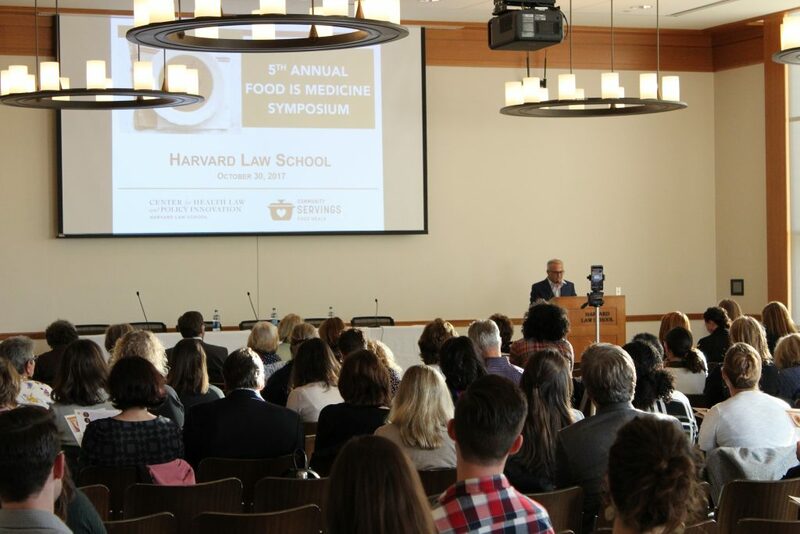 These advocates have spearheaded efforts to create food systems that are healthy, sustainable, and transparent,” says Nicole Negowetti, Clinical Instructor at Harvard Law School Food Law and Policy Clinic. The toolkit has eight sections covering the general legal setting surrounding food policy, local food infrastructure, land use planning and regulation, urban agriculture, consumer access and demand, and school food and nutrition education. The updated edition includes two new topics, procurement and food waste, and identifies emerging food trends, such as ethical sourcing of foods produced with animal welfare and fair labor practices. It highlights innovative local policies including the Double Up Food Bucks program, which doubles food assistance dollars spent at participating farmers’ markets. The toolkit provides an overview of local initiatives that can be pursued by individuals or organizations—from nonprofits to city planners to local government agencies—working to enact change in their local food system. For example, advocates working to improve the nutritional quality of school meals can learn about specific projects that have been successfully implemented in different U.S. cities. Likewise, advocates who want to improve access to healthy foods in their community can access recommendations for strengthening farmers markets and increasing healthy corner store initiatives. Published by Maine Public Radio on November 22, 2017. Written by Patty Wight. About 3.5 million people in the U.S. are living with hepatitis C. New, blockbuster drugs have transformed the treatment and prognosis for the deadly disease. But there’s a catch — they’re expensive. A single course of treatment, which lasts about three months, can cost as much as $90,000. The sheer volume of patients combined with the price tag for treatment limits access. When pharmacist Katherine Patstone of Katahdin Valley Health Center tries to get insurance approval to cover a prescription for hepatitis C treatment, she consistently hits roadblocks. “In my experience, it’s normally been two to three times of going back and getting more information before they’ll approve it,” she says. Patstone says every insurance company has different requirements, ranging from how far the disease has progressed to whether the patient is an active injection drug user. There’s a reason for the strict criteria. The three-month course of treatment can rack up as much as a $90,000 tab, and even some of the less expensive options cost tens of thousands of dollars. Patstone looks one up on her computer. “Let’s see, so, if you were a cash-paying patient and you didn’t have any insurance, Epclusa, for 28 days, would cost you $43,360.80,” she says. “Basically it’s an arm wrestling match between the insurance companies and the drug companies who are gouging us, because the medicine costs about $1,000 a pill,” says Dr. Peter Millard of the Seaport Community Health Center in Belfast. Millard says he also encounters insurance companies that don’t want to pay for the drugs. “It only shows the importance of persistence and having a good pharmacist who’s willing to spend the time to appeal,” he says. In response to these criticisms, several insurance companies told Maine Public Radio that once they receive correct information, they do grant swift approval. Michael Sherman of Harvard Pilgrim Health Care says covering hepatitis C treatment is the right thing to do, but the cost has created budget challenges for insurers, especially nonprofits like Harvard Pilgrim. “No one, I think, ever imagined — for a condition that treats it’s estimated 4 million-5 million Americans — that a drug would be priced close to $100,000 for a course of treatment,” he says. The U.S. Centers for Disease Control’s estimate is slightly lower, at about 3.5 million. Still, the cost for treatment is also a challenge for state Medicaid programs. “As far as an individual drug cost, it is probably one of the higher or highest cost drivers within the pharmaceutical budgetary section of Medicaid,” says Stephanie Nadeau, director of MaineCare Services, the state version of Medicaid. According to federal drug spending data, Maine has spent between $18 million and $24 million a year on hepatitis C treatment since 2015. And that’s why Nadeau says MaineCare has imposed certain requirements for treatment. For example, patients are only given an initial 7-day supply to make sure they can tolerate it. “Then we will go into the longer supply if necessary. Because what we don’t want to do is have the cost of the drug paid for by Medicaid and then somebody stop taking it within the first few days because they can’t tolerate it,” she says. While several state Medicaid programs have been sued for restricting access to treatment, MaineCare receives high marks from primary care providers interviewed for this story as the easiest insurer to work with. They say MaineCare’s criteria is clear and, if met, approval is granted within 24 hours. But a recent report from the National Viral Hepatitis Roundtable and Center for Health Law and Policy Innovation at Harvard reached a different conclusion about access to treatment in Maine. “Unfortunately, we’ve given Maine a D+,” says Phil Waters, a clinical fellow with the Center for Health Law and Policy Innovation. The reason for that grade, he says, is that Maine requires patients to maintain six months of sobriety before they can begin treatment. “It’s contributing to the spread of the virus itself. Because as we know, the main driver of this virus is injection drug use. So not treating individuals who are actively using only serves to promote new infections and doesn’t get us to where we need to be toward eliminating the virus,” he says. Maine isn’t alone in its low score. The report awarded Ds and Fs to more than half of all states. “I get the criticism. I mean, who wouldn’t want to treat everybody?” says Matt Salo, executive director of the National Association of Medicaid Directors. Salo says the cost of treating hepatitis C is one of the biggest pharmaceutical issues facing Medicaid. “The fact of the matter is, if this drug were priced in a reasonable way at the forefront, we’d put it in the drinking water. We would give it to everybody. But it wasn’t, and Medicaid doesn’t live in an ivory tower. Medicaid lives in the real world, with real world budgets,” he says. Salo says states initially negotiated lower costs. But the math still didn’t work out. “If we covered everybody who’s got it, we would be spending as much on this one drug as we would on every other single drug combined in the entire program. And everybody said we can’t do that. That just blows a hole in the budget,” he says. The leading maker of hepatitis C drugs, Gilead, defends its prices. In an email, the company says it discounts its therapies to insurers by an average of 50 percent. In addition, the company points out that the average price per bottle for its drug Harvoni is now less than $15,000. A full course of treatment is usually two to three bottles. New drugs are bringing the price down even more. Recently, the FDA approved Mavyret, which costs about $26,000 for a full course of treatment. Market competition helps, Salo says, but what’s really needed is federal intervention. “The federal government has been doing us a big disservice by not treating this issue with the level of respect it deserves. What did we do as a county when we were facing a similar scenario with, let’s say, smallpox, or polio? We were able to come out with vaccines or cures or treatments for those. I guarantee you we did not do what we’re doing now, which is to say, ‘Well, we’ve got this great treatment. Well, let’s let people figure out how to pay for it,’” he says. The need to pay for it won’t be going away. Because of the heroin epidemic and sharing of needles, a new wave of hepatitis C infections is sweeping the country. According to the U.S. CDC, even though it’s a curable disease, hepatitis C kills more people than all other infectious diseases combined. In 2015, nearly 20,000 Americans died from hepatitis C-related causes. Written by Tammuz Huberman, Fall 2017 student in the Food Law and Policy Clinic. At Harvard Law School’s 5th Annual Food Is Medicine Symposium, one woman was especially prepared for the occasion: she wore scrubs adorned with fruits and vegetables and broccoli earrings. She, along with a captive audience of dozens of people, came to hear about how community groups, food banks, scientists, and policymakers are coming together to help low-income individuals with chronic diseases get access to healthy and medically appropriate food. 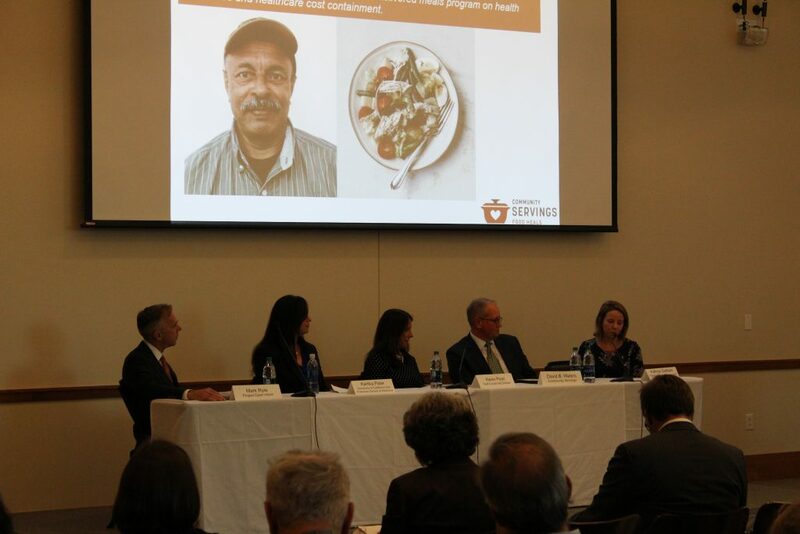 The Center for Health Law and Policy Innovation of Harvard Law School co-hosted the event with longtime partner Community Servings, a nonprofit nutrition program in Massachusetts. They brought together a fascinating and compelling roster of speakers that, despite their different backgrounds and organizations, all surprisingly touched on a similar theme: Food Is Medicine makes good business sense. 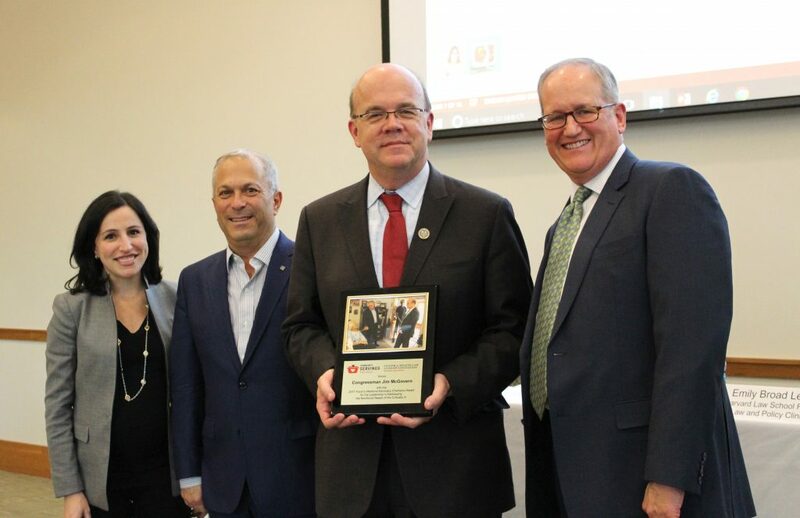 Emily Broad Leib from Harvard Law School Food Law and Policy Clinic; Robert Greenwald from the Center for Health Law and Policy Innovation; Congressman Jim McGovern, the first recipient of the Food is Medicine Advocacy Champion Award; and David Waters of Community Servings. Sue Joss, the CEO of Brockton Neighborhood Health Center, a non-profit, multicultural, community health center serving low-income, diverse, medically underserved patients in Brockton and surrounding communities, made an especially powerful case. When Brockton Neighborhood Health Center joined forces with Vicente’s, a local grocery store, both Brockton’s patients’ health outcomes and Vicente’s business improved. As part of their partnership, Brockton and Vicente’s run a cooking program that teaches Brockton Neighborhood Health Center patients how to make healthy foods that taste good and respect patients’ diverse cultural traditions. This program not only helped 84% of participating diabetes patients improve their blood sugar levels, but also found that patients that were taught how to cook were able to sustain cooking practices and the corresponding health outcome improvements even after the cooking program ended. What is good for patients is ultimately good for Vicente’s too: the grocery store experiences strong sales from its partnership with Brockton, and strong profits since fresh produce is typically pricier than other foods. The work these two organizations are doing together is a really incredible—patients are getting healthier, lowering their health care costs and supporting local businesses by putting dollars back into the local economy. When asked how Food is Medicine interventions fit into our nation’s broader conversations about how best to address the social determinants of health, Karen Pearl, the president and CEO of God’s Love We Deliver, a medically tailored meal provider, made a persuasive argument for including Food is Medicine in these discussions: Food Is Medicine programs are a low cost, high impact intervention for those populations that are not benefiting from traditional healthcare. Pearl and her co-panelist Mark Ryle, the CEO of Project Open Hand, another medically tailored meal provider, are essentially making the business case for Food Is Medicine. When traditional and expensive medical options are not working for a patient, a food intervention is a comparatively low-cost fix that has the potential for really, really big results. And so far, data wholly support this proposition. As Food is Medicine research results continue to come out, as patients continue to see improvements in the treatment and management of their health conditions, and as healthcare costs go down as a result of food interventions, the business case for Food Is Medicine will be hard to ignore as a legitimate, effective and worthy healthcare tool. The Center for Health Law and Policy Innovation (CHLPI) has monitored trends in state Marketplaces for the past three years of open enrollment. CHLPI has been concerned by lower rates of coverage and higher cost-sharing for necessary HIV and HCV treatment regimens, particularly in the Silver Qualified Health Plans (QHPs) offered across the nation. This is alarming because Silver QHP are meant to be the most cost-effective plan for low- and moderate-income individuals. These failures to meet the needs of people living with HIV/HCV means that these individuals cannot fully realize the promises of the Affordable Care Act. CHLPI is continuing this effort today with the start of open enrollment with a dual purpose. First, CHLPI, alongside sixteen state partners conducting plan assessments, hope that the information gathered can be useful as people living with HIV, Hepatitis C, and other chronic illnesses seek to enroll or renew their plans during the shortened Open Enrollment and select the plans that offer the best coverage and lowest cost-sharing for them. Second, CHLPI will hold insurers accountable for any discriminatory practices discovered, including inadequate coverage of HIV/HCV medications as well as disproportionately high cost-sharing imposed on HIV/HCV treatment regimens. CHLPI will work with its state partners to spur both state and federal regulators to action and hold insurers accountable for their discriminatory practices. Review the previous two years’ assessments online.